The Canonization of two Popes, Pope John XXIII and Pope John Paul II, took place April 27, 2014 on Divine Mercy Sunday. This canonization was the first historically since it was performed by two Popes, our current Pope Francis and Emeritus Pope Benedict, in which two Popes were canonized. 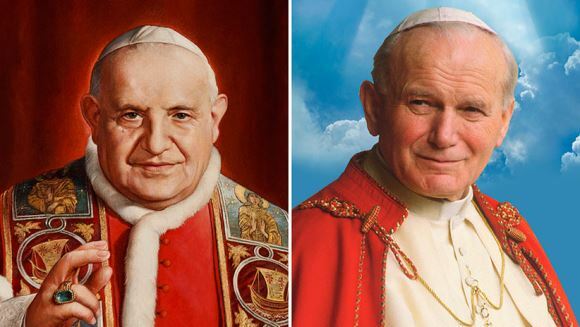 The canonizations of Pope John XXIII and Pope John Paul II April 27 marked a historic moment for the Catholic Church. To explore the meaning of the lives of these modern-day spiritual heroes, the U.S. Bishops Office for Media Relations asked several persons to reflect on their contributions. Writers include scholars and theologians - Catholic, Orthodox and Jewish - and media personnel involved in coverage of the much traveled John Paul II. Each could have written a book, but were limited to the brief reflections presented here.